Chichester City are back on top of the Southern Combination premier table after a 2-0 win at Little Common. Gicu Iordache and Scott Jones scored either side of half-time to put Miles Rutherford's team back in pole position, a point clear of Horsham YMCA, who did not have a game. Up to third are Pagham who hammered Langney 6-0 at Nyetimber Lane. 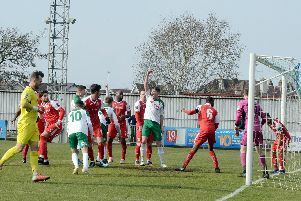 Howard Neighbour netted a hat-trick while Shane Brazil, Liam Humphreys and Callum Overton were also on target. In division one of the SCFL there were away defeats for our three local sides. Selsey lost 2-0 at AFC Varndeanians, Sidlesham went down 3-1 at Bexhill and Midhurst lost 2-1 at Southwick, where Grant Radmore was their scorer. Bosham earned a point in division two as Alex Barnes scored all three in their 3-3 draw at Littlehampton - though they may be diappointed not to have won after leading 1-0 and 3-1. On Tuesday Pagham host Lancing in the Sussex Senior Cup while Selsey go to Crawley Down Gatwick in the Peter Bentley Cup. Then on Wednesday Sidlesham are away to Mile Oak in the Division 1 Challenge Cup. Bognor were without a game today - their scheduled Bostik premier home clash with Corinthian Casuals was called off because of Casuals' FA Cup commitments.